Naked mole rats are small, hairless, subterranean rodents native to eastern Africa. 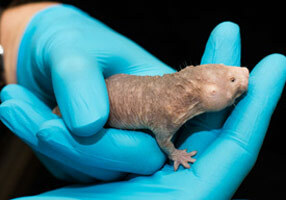 In a newly published study, University of Rochester researchers show that better constructed proteins are the key to the naked mole rat’s longevity and health. Naked mole rats have what any animal would want. They live long lives—about 30 years—and stay healthy until the very end. Now biologists at the University of Rochester have new insights into the animal’s longevity—better-constructed proteins. Their work focused on naked mole rat ribosomes—the site of protein creation in the animal’s cells—and began by happenstance. Gorbunova and Seluanov were working with ribosome RNA (rRNA) when they made a discovery. After applying a dye to a sample, they studied it under ultraviolet light only to find three dark bands—representing concentrations of different rRNA molecules—not the two bands that are characteristic of all other animals, suggesting that there is a “hidden break” in the naked mole rat rRNA. Since rRNA is an essential part of the protein-creation mechanism, the two biologists decided to see if the broken rRNA affects the quality of naked mole rat proteins. Gorbunova and Seluanov discovered that the naked mole rat’s rRNA scaffold is indeed unique. The rRNA strands split at two specific locations and discard the intervening segment. Instead of floating off on their own, the two remaining pieces from each strand stay close to each other and act as a scaffold on which ribosomal proteins are assembled to create a functional ribosome—a molecular machine that puts amino acids together to create proteins. And the results are impressive. “This is important because proteins with no aberrations help the body to function more efficiently,” said Seluanov. 1 Comment on "Better Protein Creation is the Key to Longevity for the Naked Mole Rat"
Assuming that man would be killed ultimately by cancer even if he overcomes all the infectious diseases and life style diseases like Diabetes, Hypertension, coronary diseases setting apart for the accidents, terrorism and wars to perish prematurely it comes out that to extend longevity one should stop translational errors in the DNA and extension of telemeres . This means that protein making machine which is nothing by ribosome should be sturdy enough to produce transcription and translation error free so that cancer producing defects in A,C,T,G the alphabets of life is not done frequently by mutation. The inspection of this protein which is error free is accomplished by three parts of Ribosomes instead of two parts as it now exists for humans.This advanced technology is used by evolution in naked mole rat. They are deep earth living and have no predators or enemies to kill them early. but.. Hmmm..humans are always engaged in wars and terrorism and evolution may think that it is not necessary to give them longevity, since even if modification is given in their ribosomes or telomeres lengthened, humans will end their lives prematurely because of their overzealous brains to conquer. Thank You.